WE WERE TOLD today was the day. After 70 days of some talking and some faffing, we were promised a government. It all looked pretty safe at dawn – Enda was getting the nod from some of the unlikely lads of the Rural Five and the Independent Alliance. But it all almost went to pot before the noon, then 1pm, then 2pm deadline. What was leaving the Taoiseach a little red-faced? A turf war. Didn’t someone once say it was always the small things that trip you up in politics? 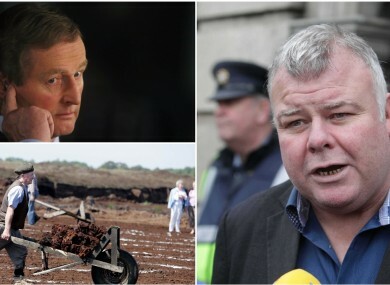 Once Kenny lost the support of Michael Fitzmaurice over the Galway-Roscommon TD’s demands around the fast-tracking of planning permission for access roads to bogs, the alliance with the rest was on sinking ground. The original Dáil vote was scheduled for 12pm but as the clock ticked by, the independents were nowhere to be seen, leaving many Fine Gael TDs biting their nails and wondering if – after 10 weeks – they would have to go back to the people afterall. A senior Fine Gael source confirmed the sticking point in those dying hours was turf, stating there were some very robust conversations right up until noon as to what might happen. So, what did Fitzmaurice want? His wishlist included demands over how planning permission for access roads to bogs is given. Speaking to RTÉ’s Morning Ireland earlier today Fitzmaurice said: “I’m looking for a way of fast-forwarding the relocation of people cutting turf in banned bogs, and of trying to solve this problem. Particularly in the case of these conserved bogs, I want to ensure that people who have been working these bogs won’t be waiting two or three years for planning permission. A senior Fine Gael source said it all revolved around the wording of the draft document for government. Both parties to the argument had received legal advice and, surprisingly, they didn’t match up. Fitzmaurice had been told by his counsel that the wording could be amended to suit his needs, while Fine Gael insisted the complete opposite. “He wouldn’t move on the issue, and that is understandable,” a source said. It is understood that during last night’s talks with Fine Gael, there were some heated and somewhat aggressive words over the issue. In the end, these were irreconcilable differences. Fitzmaurice wasn’t going to be an Endapendent. But the question now, would his Independent Alliance colleagues stick by him or take their seats at the Cabinet table? There were others among them with concerns of their own. Westmeath’s Kevin Boxer-Moran and Galway’s Sean Canney were also worried about turf-cutters rights, a western rail corridor and other rural affairs right up until the very last second. “We basically wanted to use our clout to support them, so we hung in there to resolve the issues,” Finian McGrath of the Independent Alliance told TheJournal.ie. Both Boxer-Moran and Canney’s issues were sorted out but those sticky bogs remained for Fitzmaurice. But Shane Ross’s Alliance wasn’t going to exit stage left as a band of brothers. We didn’t fall out. Michael said he couldn’t go with the agreement. We agreed to disagree with that issue. Michael said he felt, he didn’t want to bring down a government over one issue so he did the honourable thing and withdrew from the process. The Independent Alliance had long said they would vote as a unit but the crew had a few stumbling blocks that they already got over – John Halligan’s cardiac unit in Waterford Regional Hospital for one and Ross’s local garda stations another. But then there was turf. In the end, Fitzmaurice abstained, allowing his friends to vote for Kenny. He abstained from the vote and we are trying to resolve this internally now. If we can resolve this internally, I wouldn’t rule out Fitzmaurice coming back in. That could also happen if the Department of the Environment, which makes the planning applications, finds a way to resolve the issue. Without Fitzmaurice, Kenny’s nine lives come in the shape of Shane Ross, Kevin ‘Boxer’ Moran, John Halligan, Sean Canney, Denis Naughten, Michael Lowry, Katherine Zappone, Michael Harty and Finian McGrath. And so it was turf and not which ministerial positions were up for grabs that led to Kenny being voted in with just 59 votes – the lowest level of support in the State’s history. But, of course, there were demands about those coveted places at the top table. Shortly after the vote, the Independent Alliance met and put down their demands. Scooping his new boss, Shane Ross was the first person to confirm his seat at the Department of Transport, Tourism & Sport. The rest, we’ll find out before long. Email “It was turf, bogs and roads that threatened Enda Kenny right to the end”. Feedback on “It was turf, bogs and roads that threatened Enda Kenny right to the end”.